Want to become an instant millionaire just by playing poker? Between May 14th and July 14th players at www.888Poker.com have the chance to be part of a $1,000,000 prize pool, with plenty of other sweet treats to scoop up along the way. All you need to do is join in on one of the the $2K Gold Chip tournaments and play your way to the top 100 in order to receive a gold chip. The first player to receive 10 consecutive gold chips becomes the winner of the incredible million dollar prize. This doesn’t mean you have to play every day, it just means you need to be part of the top 100 players in every consecutive Gold Chip poker tournament you participate in. The great thing about this is that if you don’t make it to top 100, you haven’t missed out your chances of becoming a millionaire, you simply need to start again. And with the promo running until mid-July, there’s plenty of time to catch up. You’ll also receive cash prizes when you collect three or more gold chips, with prizes starting from $20 for three gold chips increasing all the way up to $100,000 for nine gold chips. Earning gold chips will also grant you more entry tickets into the $2,000 Gold Chip tournaments. So millionaire or not, there are some awesome rewards to be won during 888’s Million Dollar Money Grab promotion. There are two easy ways to enter the $2K Gold Chip tournaments. 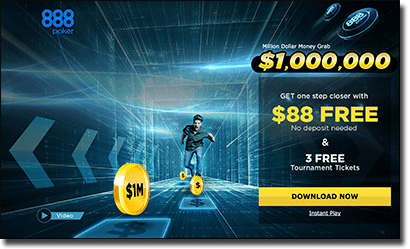 If you don’t have an account with 888Poker, you can sign up to score one free entry ticket as part of your welcome package, along with a bonus $88, with no deposit required. The other way to enter is to make a real money deposit, where you will be rewarded with an entire day of free tournament entry tickets. The more you play, the more chances you have to enter.